Bill and Kati Barrett were honored by the Texas Forestry Association as the Outstanding Tree Farm of Texas in 2000. They also received the 2002 Forestry Conservationist of the Year Award from the Soil and Water Conservation Districts of Texas, Region IV. The tree farm is located on 1960 acres in northern Walker County. "The Barretts deserve to be recognized for their many years of excellent forest management and their commitment to forest stewardship," said Ron Hufford, Executive Vice President of the Texas Forestry Association, when presenting the award for Outstanding Tree Farm of Texas. 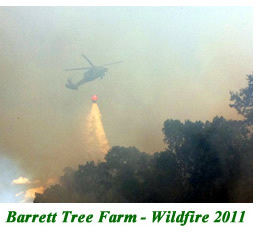 The Barretts' management plan which includes prescribed burning and natural reseeding, promotes and improves water quality, wildlife habitat, soil conservation, and marketability of forest products. During the 40 years of their ownership of the property, the pine timber volume has increased approximately ten-fold due to natural regeneration and conservation-cut harvesting of only 80% of the annual re-growth factor. The Barrett family frequently hosts tours for those interested in learning more about pine production and environmentally-sound forest-management practices. Texas A&M University Forestry students often use the tree farm for on-site learning projects. Professional management of the property is provided by Lone Star Forestry, Huntsville, Texas. Because of ongoing drought and some wildfire timber losses on the property, the family has worked diligently with the United States Department of Agriculture through its EQIP and WHIP programs. Those programs provide funding assistance to landowners in forest management and wildlife enhancement. 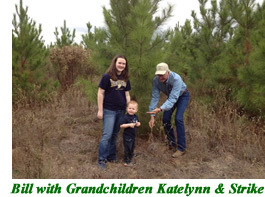 The Barrett family utilizes the funding to replant pine seedlings in damaged areas of their forest. Thirty to 40 years from now, the family will begin to reap the benefits of those efforts. Click here for additional Timber Production photos!